North Korea barred a delivery of supplies to South Koreans in the closed Kaesong industrial zone Wednesday, as the South's president said it was time to stop rewarding Pyongyang's provocations. A delegation of 10 businessmen representing the 123 South Korean firms in Kaesong had applied to travel to the zone to bring food and other daily necessities to their staff and to inspect their facilities. "North Korea informed us that the request for a visit... had been turned down," said Unification Ministry spokesman Kim Hyung-Seok. "It is very regrettable that the North has rejected the request and disallowed a humanitarian measure," Kim said. North Korea has blocked access to Kaesong -- which lies 10 kilometres (six miles) inside its border -- since April 3 amid soaring military tensions on the Korean peninsula. South Koreans in Kaesong at the time were told they could leave when they wanted, but as of Wednesday there were still 200 remaining. The North withdrew all its 53,000 workers and suspended operations in the zone on April 8. "Humanitarian problems are bound to only worsen as days go by," Kim said. 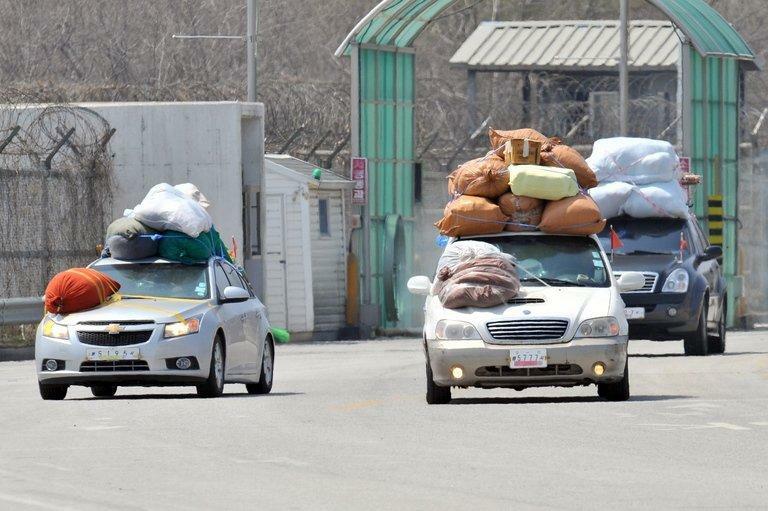 Three cars crossed back into South Korea from Kaesong on Wednesday, all laden down with bundles of products and personal belongings squeezed into every available seating space and tied onto the roof. Oh Heung-Gi, a 50-year-old clothing company employee, said the situation was increasingly difficult for those holding out. "It's tough, but everyone helps each other to cope with the problem of food shortages," Oh told Yonhap news agency. 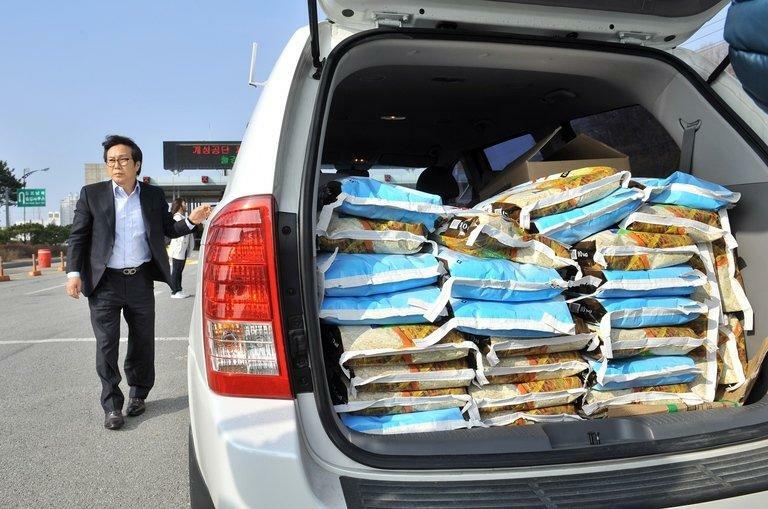 Among the supplies the business delegation had wanted to take to Kaesong on Wednesday were boxes of rice, medicine and the Korean food staple, kimchi. "It's not like anyone is starving, but the food is clearly running out and what's left isn't up to much," a Unification Ministry spokeswoman told AFP. Kaesong was established in 2004 as a shining symbol of inter-Korean cooperation. On Tuesday, North Korea said the South was seeking to shift responsibility for Kaesong's closure, which Pyongyang insists was forced by Seoul's policy of "confrontation" and its "war-mongering" statements. "The puppet regime can never escape from the criminal responsibility for putting Kaesong in this grave situation," the North's state body in charge of special economic zones said in a statement. The South is "clinging to sanctions against the North, while bringing in massive volumes of new war machines and madly engaging in exercises for a war of aggression while prattling about dialogue," the statement said. Neither of the Koreas has allowed previous crises to significantly affect the complex, which is seen as a bellwether of stability on the Korean peninsula. Seoul's offers of talks to find a way out of the current impasse have been dismissed by the North as a "crafty trick". South Korean President Park Geun-Hye, who was elected on a promise of greater engagement with Pyongyang, said Seoul would not be intimidated into a dialogue. "We must break the vicious cycle of holding negotiations and providing assistance if (North Korea) makes threats and provocations," Park told a gathering of foreign ambassadors. On Tuesday, North Korea had threatened the South with "sledge-hammer" retaliation unless Seoul apologised for anti-Pyongyang protesters burning effigies of its revered leaders. 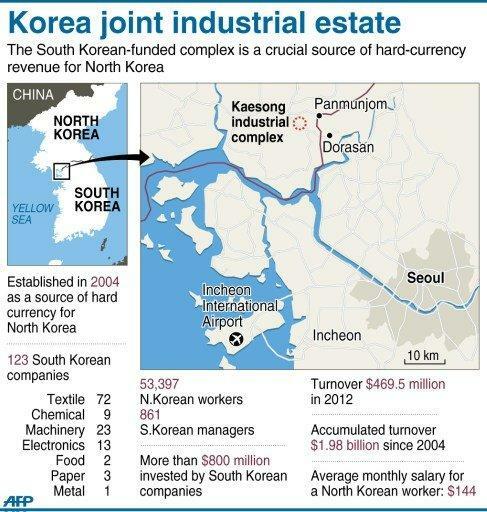 Kaesong is a crucial hard currency source for the impoverished North, through taxes and revenues, and from its cut of the workers' wages.